Nice. Thanks for the info. Looks like we'll get a little break in this salty but not severe weather late Friday and early Saturday. We'll see! Is there a way to see/revive these images? The links seem to be broken..
Way to hang with it, despite that snow pack! That's deeeep! Looks like you really earned that quality ice with your wallowing down low. I'm guessing there's been some consolidation since your pictures, but here's hoping the warm temps over the next 10-14 days don't up the avy danger or ruin the snowpack otherwise - planning a visit at the end of the month. Just finding this TR - awesome solo effort and great storytelling - congrats on the Jeff summit and thanks for the tour! @OlympicMtnBoy Hey, my pleasure. The sense of freedom and wildness up there were palpable - had to share! 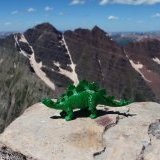 @Wildearth Thanks for the compliments... the scenery made photos/video easy! What an adventure. The airy feelings from the ridge still make my hands sweat. Cheers! Great use of that day! What views. And to think all I did with that weather window was mow the lawn... Thanks for posting such great images of the route! Thanks a lot, @Drederek ! I definitely felt like I got away with something, and the conditions had me considering early retreat several times. And you're right, the snow started at the lake when I was up there, and it's been two weeks at this point, so travel is pretty uneventful as long as the weather cooperates. Trip: Mount Constance - South Chute Solo in a Day Trip Date: 06/23/2018 Trip Report: Climbing alone is not a priority for me, and shared mountain experiences with others are among my most vivid and cherished memories. However, climbing alone offers its own rewards... the quiet focus that comes from hours of not speaking, the attention to the wilderness that is required when you are solely responsible for yourself, and the rhythms of moving your own body over distance at your own pace and direction. I moved with my little family to Seattle in Autumn 2017, settling in north Ballard. 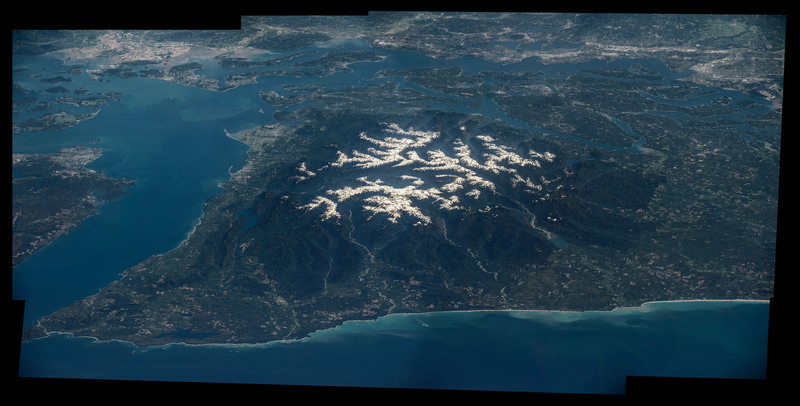 Nearly every clear day since then my eyes have fallen upon a previously unknown to me mountain range of incredible beauty: the Olympics. Before moving to Seattle, I was only aware of the precipitous North Cascades and of course the big volcanoes. Now, I sip coffee and watch the light of the sunrise light up the eastern slopes of the Brothers; a bowl of snow and rime ice during the Winter months. The twin summits of the Brothers, with the elegant, scalloped ridge connecting them, were the first climbing objective that gripped me. I started to plot and plan an ascent, but the traverse would necessitate a partner. I planted the seed of an alpine outing with my climbing partner and watered it frequently, only to be reminded that scheduling and harmonizing lives from thousands of miles away can actually be the crux before the climb even starts. Alas, the Brothers traverse would have to wait. But what of summer, with its long days, relatively stable weather, and more forgiving conditions in the alpine? Surely there is another climb that can be born of this spectacular season? Of course, just a few degrees to the north, an even taller and more steeple-like summit beckoned: Mount Constance. Despite a state literally filled with fantastic alpine objectives, I was a prisoner to the spires I watched filter the sunset each day. So, the last-minute plan for a solo trip to the Buckhorn Wilderness was hastily constructed to take advantage of one of the longest days of the year... The Olympic National Forest, National Park, and the Buckhorn Wilderness are an utterly fantastic landscape. Without a climbing partner to share in the experience, I was compelled to share the experience post-climb through images and video. There is no shortage of information on the more technical aspects of climbing Mount Constance, with much of the best information hosted right here on CC.com. So instead I have assembled these images in a more story-telling fashion, you can find a load of Strava data here, here, and here, and you can watch the short I made of the climb here: I left downtown Seattle on the Seattle-Bridge Ferry the evening of July 22. Packed ferries meant I got the opportunity to sit at the ferry terminal for an extra 90 minutes and really soak in the city from that waterfront vantage. What a fantastic intersection of city and sea: <Leaving downtown Seattle behind.> I landed at the Dosewallips Road washout around 7pm and quickly got to setting up camp (in the Subaru), eating a burrito, and exploring the eastern-most washout area. Nice spot. I shared the "trailhead" camp with about a dozen other vehicles: Mosty party campers with fires and late-night laughter, but I did see a number of backpackers head out and up the valley late in the evening. <Dosewallips Camp. Big firs and cold water.> It rained all night, which was a nice serenade sleeping in a station wagon. In the morning I brewed up and left the car on my MTB right at 5am. <No need for a headlamp this close to the Soltice.> I really appreciated the advice of previous TRs on taking a bike for the Dosewallips Road approach. The climb from the first washout to the trailhead is not negligible, with around 900 ft of ascent before you even get off the road. A beautiful re-wilding of the Dosewallips valley is happening as slowly-but-surely the rainforest is reclaiming the previously developed road and campsites. I stashed my bike under the first bridge, about a half-mile before reaching the Lake Constance TH. <Dosewallips Road near the TH to Lake Constance.> <There is no longer a sign marking the start of the Lake Constance trail, but there is a subtle flagging as seen here.> As many others have noted, the early stretches of "trail" that lead through the old burn are pretty technical in that there is a lot of mantling and hoping over downed logs. It could probably use some maintenance for long-term durability, but I was thankful for the grade. Nothing like putting down a three thousand feet in just a few miles! It really is more of a climber's trail than a backpacking trail. The ecology of the Constance Creek valley is quietly beautiful with all of the accoutrements of a wilderness old-growth forest: countless waterfalls, moss on every surface, towering cedars and firs, and just enough devil's club to make it feel like you had to fight for your views of Lake Constance. I got to the lake at 8am, just in time to share a few quick words with a group of six or so people that were heading down from several days of camping and hiking, including a climb Constance the day prior. I passed one other pair of people similarly breaking camp to head down. After these brief interactions I did not see another soul for more than 10 hours (when I passed back by the lake on descent), as I had the upper Avalanche Canyon to myself for the day. <Tranquility encapsulated in Lake Constance at 8am, and Ramaria spp. along Constance Creek.> <Spires and summits on the South ridge of Constance protect the lake from morning sunlight in spectacular fashion.> So excited to be near the glassy-smooth lake, I missed the climbers trail out of the lower basin and instead found myself bushwhacking up out of the northern-most lake campsites. I made 600 or so feet of elevation progress before I found my way out and back on to the snow. Perhaps obviously, I do not recommend this particular bushwhack over the trail through the snow. <Back on the snow, it was easy to stay moving and motivated with views like this!> Avalanche Canyon really is a spectacular cathedral of pillow basalt and snowfields. It feels as though it is guarded by the sharp spires that surround the rim. 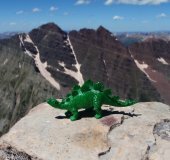 As I progressed into the basin, I found myself daydreaming and plotting lines up the walls, leading to sharp perches above the canyon. I am certain that climbing on this rock is possible and probably even fun, but protecting a climb on this kind of rock would be a different story... <Aiming for the Cat's Ears shortly after leaving the lower basin. Mostly scree all the way to the notch at the top of the South Chute.> At this point the clouds began to boil and rise in the lower basin and it felt as if the clouds and their poor visibility chased me up to the notch. From the notch, semi-obscured views of the upper ridge and route were a harbinger of the climb and route finding charade that was to come. <At the top of the South Chute notch. Good place for a bagel break.> Despite the warm temperatures and soft snow in the intermittently sun-exposed areas, persistent shade from clouds and rock in others made for some crispy morning snow climbing and traversing. The conditions made me glad that I lugged both ice axe and crampons up the trail that morning. As I ascended towards the second notch, the left-most of the three at the top of the scree gully, I finally got an opening in the clouds to see where I had been and the setting of the South Ridge of Constance. It is a really grand alpine playground of snow slopes, loose scree, and old relics of the volcanism and uplift that created the Olympics... when you can see it! From here, the rest of my climb was stretches of crystal clear blue sky above alternating with in-a-cloud 200 ft visibility. This poor visibility, combined with lack of partner for consultation and memory, made route-finding a bit more difficult as I had to scout and re-check my route decisions a bit more. "Olympic Class 3" climbing is a little spicier than Colorado where most of my climbing experience lies, but in general I would rate the upper reaches of the climb as a super-fun scramble. The stretches of steep snow were an enjoyable reprieve from the scree and loose rock jungle-gyming, even when frozen enough to require crampons. For the sake of future trip planning, if I were plotting a repeat climbing visit to any part of the Constance massif, I would definitely aim for even earlier in the season to take advantage of more snow high on the mountain. <Looking back from the second notch during a brief opening in the clouds.> <Looking south near the entry to the Finger Traverse and associated bypass.> I did my due-diligence before the trip began, getting a solid idea of the exposure expected and what the psychological cruxes would be since I was solo. The Finger Traverse seemed like the best way to go, but as I climbed through the clouds I apparently missed the entry to the Finger Traverse proper. I ended up on the west side of the ridge, which I now understand to be the FT bypass. This route was the natural way I found my path over the ridge, and definitely does not exceed 4th class or the exposure of the FT, so I am guessing many parties find themselves traveling this way. I found the FT once I rounded the corner. At that moment in the season there was still a solid bumper of snow perched on the open book of the FT, but that did not make it seem any less airy! <Looking back at the Finger Traverse after rounding the pinnacle via the FT bypass route. I ordered up a sea of clouds for this one for extra dramatic effect.> <First glimpse of the summit block and upper reaches.> <From the base of the "yellow wall", looking back up at the route down from the FT and FT bypass area. Nice to have some soft snow for once!> From there, I was at the summit block in no time, a hunk of imposing basalt with little visible weaknesses until you traverse counter-clockwise around it to find the west face. <Summit block from the east.> <Looking north at the climbable side of the summit block from the west side.> After a few airy fourth class moves to pass the summit block while in generally clear conditions, I found myself straddling a rock on the summit of Mount Constance just before 2pm, half way to a goal realized... an ascent like this is only a success once you get back to the safety of your home and family. I only hung around on the summit for a few minutes. The wind began to whip, and the clouds boiled higher, strongly suggesting I would need some extra time to negotiate the poorly visible route on my return. <Obligatory summit-with-boot shot looking south down the ridge. The FT is visible near the snow with the light/shadow line, and looks pretty spectacular from this vantage. What a mountain vista!> <Looking south towards the FT/TT routes (prow at top center), which are accessed by ascending the snow up to the right of this view. Shortly after I took this image, the clouds socked me in for a more intimate version of the climb route on the way down.> <Finally back at the notch of the South Chute, out of water and ready to call it a day, but still 4k+ feet of descent to go!> <The kinds of views I was treated to for most of the descent. Route? Which route? Just follow the weaknesses in the clouds...> <Back in the lower basin: interesting geology and clearing views back into Avalanche Canyon.> <A sleepy Lake Constance on descent.> <Back in the safety of the rainforest.> Aside from the circuitous and comical route-finding in the clouds on the way down, the descent was relatively uneventful and even euphoric as I boot-skied my way down scree and snow to the bottom of Avalanche Canyon. I came upon a seemingly 100% still Lake Constance again, this time with a veil of fog and the sounds of two people setting camp for the evening near the shores of the lake. I shared a view words of camaraderie as I passed their camp, and began my descent towards the Dosewallips River with haste - I wanted to make it to the docks before the last ferry! I arrived at my bike around 7:30pm, and a few hoots, hollers, and a whopping 25 minutes later I was back at the car at 8pm eating left-over burrito scraps and changing clothes, almost exactly 15 hours after I had left. I made it in time to catch the midnight ferry back to downtown Seattle, a sparkling metropolis on the calm flat Puget Sound, and a sharp contrast to the steep wilderness in which I had spent my day. I did not originally intend for my first climb in Washington to be a solo one, and indeed I am looking forward to sharing experiences like this with partners on future adventures. However, the solo experience was far from a waste. Moving quietly and quickly through the jewel of wilderness that is the Buckhorn area, I have been left with a deep well of gratitude for this preserved land and the freedom and health to roam it. __________________________________________ Original post, below. __________________________________________ I'll edit this TR with pictures and full descriptions within a week or so once I get my images onto my computer. For now I just wanted to upload this TR for those of you that are curious about route conditions and perhaps planning a climb for Independence Day weekend. Also, I'm new to the CC site, so Hello! This site is an amazing resource! Car-camped at the Dosewallips washout Friday 6/22, it rained all night. Left the car at 5 am on the bike, stashed the bike at the first bridge and continued on foot from there. Arrived at the Constance Lake around 8 am. Missed the turn for the climber's trail out of the lake area and ended up bushwacking for about 600 ft of elevation out of one of the campsites until I made my way back to the snow/climber's trail. Visibility was intermittent due to fast-moving clouds lapping over the primary ridge, making route-finding past the top of the South Chute quite difficult at times. South-facing snow was soft when in the sun, but frequent cloud cover kept many of the higher snow slopes frozen - ice axe and crampons on the steeps were essential the day I was up there. Also, as several others have noted, "Olympic 3rd class" is indeed a little stiffer than Colorado 3rd class. Summited around 2pm with spectacular views of Warrior Peak, Inner Constance, and The Brothers summits poking out of a fast-moving sea of clouds. I descended by reversing the South Chute route. Despite having just climbed through the maze of the South Chute with poor visibility, descending via the same route in even poorer intermittent visibility made route-finding difficult again. A partner or more route pictures/notes would help immensely in such conditions. Descended back to the bike by around 7:30pm, and back to the car by 8:00pm for a 15 hour car-to-car. Caught the midnight ferry back to Seattle and home by 1:30am. This is a fantastic climb! The maze of gendarmes, scree and snow slopes along the ridge is an experience I won't forget! Gear Notes: Helmet Ice axe Crampons Approach Notes: Bike was key for the approach. Trekking poles were nice for the Lake Constance trail between Dosewallips and the lake, both for up and down.